My office visited Flip today for Marcia's special birthday lunch. Luckily we had no problem scoring a table and I was glad to finally check this place out. Overall I would describe it as a fun place to go, with some creative ideas for burgers, sides and shakes. I was not blown away by the beef burger I tried (the Butcher Cut, pictured below), but it was definitely tasty. The burger was overcooked for my taste, despite our server telling us that everything came medium rare unless you requested otherwise. I really liked the Po Boygur, which I was fortunately able to taste. The size of the burgers is small, but one along with a side is probably just the right amount. With such a large group, we tried all of the milkshakes offered and I, loyal blogger that I am, tasted them all. My favorite was the Nutella, followed by the pistachio. The Krispy Kreme was not as good as I'd hoped and the foie gras was too meaty (surprise) for my taste. Assortment of sides. I liked the fries and the smoked Caesar salad (not pictured) best. The Po Boygur - delicious with a slice of fried lemon on top. Lamburger (left) and Butcher Cut with caramelized onion, blue cheese and red wine jam. Nutella milkshake with toasted marshmallows. Do you think we had enough to drink?! While my dad was here we dined at Rumi's Kitchen, an Iranian restaurant I've been wanting to try for quite some time. We really enjoyed our meal, especially the appetizer dips that we ordered as well as the succulent meats - my favorite was the ground chuck kabob. The entrees are HUGE, especially considering they bring you lots of fresh flat bread and a plate of cheese, butter, mint & walnuts to start. The desserts were also tasty, especially the creme brulee, which had a tea flavor and the traditional Iranian ice cream, which I didn't manage to photograph. This palce is definitely worth a trip OTP - and for me that takes a lot! Front: Shirazi Salad; Back left: Mast mousir (yogurt garlic dip); Back right: Borani spinach (spinach onion dip). Left: Soltani Kabob (seasoned ground chuck kabob and beef tenderloin kabob) with saffron rice; Right: Rack of lamb with seasoned raisin rice. Homemade oven fries with garlic powder, salt & pepper and doctored-up ketchup. The plate says, "The cook is not responsible for cat hair in the food." That would be Quincy's responsibility! The all American hot dog with chili, onions and slaw. Update: Sadly, Allegro closed on 2/15/09. We will miss you! Even though Cal's birthday is in October, we just made it to his birthday dinner! Ever since I went to Allegro with some girl friends during restaurant week last year, I wanted to take him there as he's a big fan of Italian food and we are usually eating Asian if I have anything to say about it! Our weeknight meal was sublime, and our server was gracious and helpful. The only unfortunate thing was the noise - there was a group of some sort meeting at the bar and being rowdy and despite the fact that our table was about as far from them as you could get, the noise reverberated through the whole place. In addition, there was a patron who stood out as being the loudest person I have ever encountered in a restaurant. It was so bad that the other tables (including us) were looking at each other and shaking our heads. This guy was SO LOUD! Anyway, we had a wonderful meal in spite of the difficulty in hearing each other and I would recommend Allegro for a special occasion Italian meal. We shared the Contadina Salad: bibb lettuce with carmelized onions, white creamer potatoes, tomatoes, asparagus & olives in a balsamic vinaigrette. Grilled grouper fillet over greens with raisins in a creamy sauce. This was so delicious, we both kept switching plates! Tagliatelle funghi e asparagi - mushrooms & asparagus in a light cream sauce. Some of the best pasta I've ever eaten. 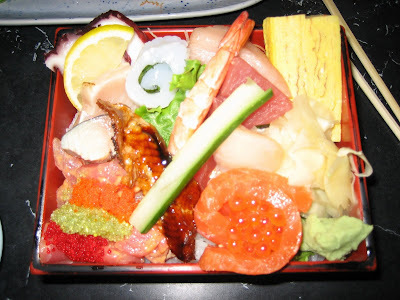 Chirashi - a multitude of raw fish and seafood served over perfect rice. After hearing about this place from my neighbor, I finally ventured to Hashiguchi, Jr. and I haven't been able to stay away since! This place is hidden behind Lenox Square in a nondescript shopping center. The restaurant space is small, although they have a large private room in back. The sushi I sampled here was fabulous, especially the spicy tuna roll and the salmon nigri. I also had a bowl of tempura udon, which brought me back to my study abroad experience in Japan - filling and comforting on a cold winter's day. At lunch there are very good specials and I was surprised at how empty it was during the day. When I dined there in the evening it was much busier, but service was still quick and attentive. Another good sign is that both times I went, several groups of Japanese speakers were there. I even practiced my language skills a bit with the waitstaff, who all appear to be Japanese as well. At the cash register they sell Japanese snacks like Pocky and some traditional canned and bottled beverages. The green tea ice cream here was fabulous as well, with a very strong green tea flavor. Tempura, sushi & sashimi bento box, served with soup and salad as well as the small seaweed salad and Japanese pickles pictured here. Salmon nigri, spicy tuna roll and tempura udon soup.